The textbook theory of lunar formation goes like this. Late in the formation of the solar system came the “giant impact” phase, when hot planet-size objects collided with each other. A Mars-sized object grazed what would become Earth, throwing off a mass of material from which the Moon condensed. This impact set the angular momentum for the Earth-Moon system, and gave the early Earth a five-hour day. Over millennia, the Moon has receded from the Earth and the rotation has slowed to our current 24-hour day. 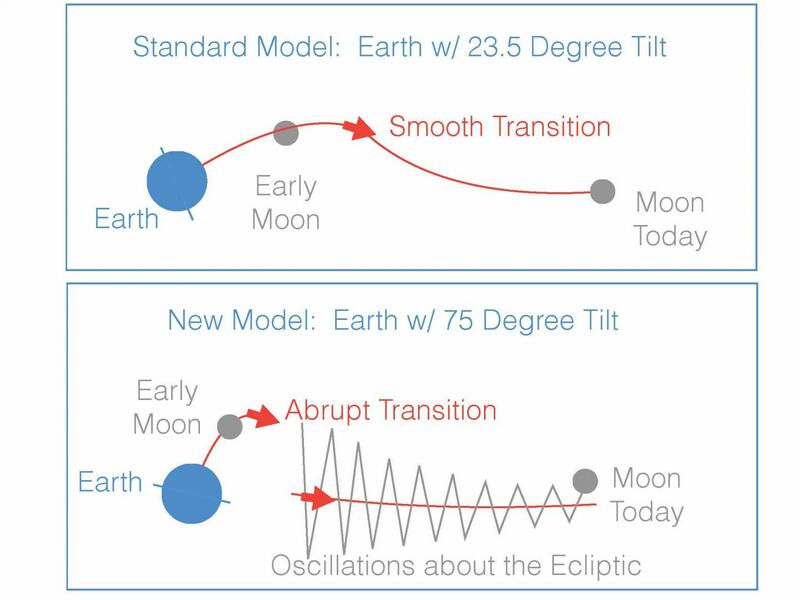 Scientists have figured this out by looking at the Moon’s current orbit, working out how rapidly angular momentum of the Earth-Moon system has been transferred by the tidal forces between the two bodies, and working backwards. But there are a couple of problems with the textbook theory. One is the Moon’s surprisingly Earth-like composition. Another is that if the Moon condensed from a disk of material rotating around Earth’s equator, it should be in orbit over the equator. But the Moon’s current orbit is tilted off the equator, meaning some more energy must have been put in to move it. Over a few tens of million years, the Moon continued to slowly move away from Earth until it reached a second transition point, the Cassini transition, at which point the inclination of the Moon—the angle between the Moon’s orbit and the Earth’s orbit about the sun—dropped to about five degrees, putting the Moon more or less in its current orbit. At the first glance it looks like something fitting in the Journal of Irreproducible Results. Where did they publish it? Nature (2016), DOI: 10.1038/nature19846. A good fit, still. Big deal. Guess how the Moon got there? It happened and Earth evolved as a result. I spend my time thinking about why the Universe is here and what’s so special about Earth that we are here thinking about it! How are you ever going to prove one way or another how the moon got there? Science develops theories, but proof is tough. Sorry, this doesn’t pass my “sound” test. buzzzzzzzzzzzzzzzzzzzzzzzz! Since my discovery–and extensive verification, along every line of study–of the Great Design of the “gods” (as I call it), it is obvious to me (and should be obvious, to anyone, especially scientists, reading the article) that the Moon’s orbit was designed, and that should have been long recognized by science, if it had not gone wrong with the extended Darwinian paradigm, that everything science observes–both the life on Earth and the Earth itself–developed through undirected evolution, that is, through undirected physical processes only (with ever more “cosmic accidents”, always “near the beginning”, needed to keep the paradigm going). The paradigm of undirected evolution–especially of the Earth, and Moon–has failed, has in fact been disproved by my unprecedented research. This factor is well noted in various ‘other’ disciplines OB. A ‘similar chemistry’ intimates a ‘similar origin’. However, the ‘size’ (mass) of the ‘moon’ would suggest a ‘co-orbit’ within an ‘orbit’. Bearing in mind that Earth’s Moon always places the ‘same face’ (same longitudinal presentation) towards Earth’s ‘centre of gravity’ suggests that a gravitational ‘teleconnection’ continues to be extant between the two bodies. Thus, the ‘two bodies’ still ‘orbit’ as one. This would be the theoretical impact of the, assumed, Thea with the/a ‘proto’ Earth. The ‘theory’ is quite plausible, but ‘the factual observation’ is negative. Whilst I sympathise with this POV it relies on the ‘truth’ within a ‘model’ (which is hard to prove). However, I do favour it. Lunar and Earth ‘tidal’ observation does imply a complicit behaviour between the Earth and ‘the Moon’ (Earth’s subordinate companion). Its late for me, I’ll finish this post later OB. Plate tectonics seems to indicate that considerable continental material is missing from the surface of the earth. Maybe the earth was not that ‘molten’ when the collision occurred? Yes, and synchronous rotation aka tidal locking (orbit period = rotation period) is standard for regular-shaped moons of planets in the solar system. But I agree there’s something more – the Sun? – going on with the Moon’s orbital behaviour due to its large size relative to Earth, as the post mentions. For example Saturn’s largest moon Titan is bigger than the planet Mercury and orbits at an inclination of just 0.34854° (to Saturn’s equator), compared to our Moon’s 5.145° to the ecliptic. On a different tack, it is arguable that without our over large moon, life would have never have left the oceans. With that said, all these scientist watching other planets orbiting distant stars rarely seem to think about how life here started and progressed. Maybe large moons around terrestrial planets is more common than we think, and not such a random process. I read a study once speculating that two large planets could form while in the same orbit, and would eventually collide with each other, so this kind of large planetary collision may not depend solely on a random object being thrown into the inner solar system. So my question is, how common are terrestrial planets with large moons, in solar systems like ours? Are the collisions that would form such moons random events, or a more common occurrence, as a consequence of how planets form in a solar system similar to ours? Quote from TA: “About 10 million years later, according to the study, another impact reversed the planet’s spin direction…..” Recalling ‘dimly’ the exercises in applied maths, that’s a big momentum change. Rotational momentum, but in the linear direction there is likely also a big effect, perhaps enough to destablise an orbit. I think this explanation suffers from the same problems the rest of the mainstream cosmological theories suffer from. As usual, this one is too complex and relies too much on chance accidents and special pleading to have any significant merit. Any new conjecture must meet the criteria that everything that happens in the Universe will follow a few simple rules, be self similar at all scales and require no special different mechanisms or accidents to explain all. Tenuc: perhaps, but the Moon has no equivalents in the solar system. I concur! ‘Earth’s Moon’ possesses ~1/3 of Earth’s mass constituent and is/has the ‘greatest’ mass property ratio for any ‘planetary satellite in orbit around a planet’ within Sol’s system. Moreover, gravitational influence is still being ‘modified’ by the ‘left over’ ‘inertia’ that generated this scenario in the first instance. IMHO we witness a changing ‘inertia/gravity’ on/within this subject. However, we also need to get back to ‘basic principles’ with a ‘cross discipline’ agenda. The subject is bigger than any singular discipline can observe/understand. Thanks for the link. I suspect that in both cases the structures are the result of aligning atoms to facilitate MEP. This ensures that the most energy possible will be extracted from the ambient photon charge field to do work. However, I don’t think this necessarily means that the extracted energy will be used for the same purpose in both systems. Will be interesting to see if this sort of structure occurs in other systems. The moon is curious in many ways. While watching a total eclipse back in 1999 in Cornwall, I was amazed to have visual confirmation that it lookrd exactly the same size of the sun. It is also strange that the density of the moon is only 3344 kg/m3, while the Earth is 5514. Perhaps if we could develop a better understanding of our small binary system, we would gain insights into how the Universe operates? On reflexion, perhaps I gave the impression Moon science is unimportant in the “universal” picture. A unique property of our Moon is how it stripped away most of the Venus-like atmosphere Earth would have developed, magically leaving a hydrosphere. I’m interested in the probability this could ever happen in another solar system. Multiply this by the probability of finding another Sol with a similar planet configuration you realise the probability of another Earth in the known Universe is mind-blowingly small. Mankind is more alone than scientists are prepared to believe. On a lighter note: Did you hear the joke about the scientist who spent his whole life looking for proof of intelligence elsewhere in the Universe? He never used his own intelligence to work out the probability of finding it! Any and all theories of Earth/Luna evolution are open for discussion as far as I’m concerned. We’re unique in the known Universe until some alien tells us otherwise. Some five or ten thousand years ago the Sumerians wrote down what their bosses told them. According to them we were indeed crashed into by a watery world called Tiamat and half the earth was smashed off, but we did gain water. They detail most of our solar system. I only put this up because the scientists are saying something similar. Everything we know about the formation of solar systems might be wrong, say two astronomers. They’ve discovered the first “binary–binary” — two massive companions around one star in a close binary system, one so-called giant planet and one brown dwarf, or “failed star” The first, called MARVELS-7a, is 12 times the mass of Jupiter, while the second, MARVELS-7b, has 57 times the mass of Jupiter. “It is also strange that the density of the moon is only 3344 kg/m3, while the Earth is 5514.” (5514 kg/m3?). This is cogent to the ‘Moon’ coalescing from/following a ‘Proto-Earth’ collision with another body Tenuc. Inertia transferred by collision is key here. Where/when inertial transfer is effected the ‘energy transfer’ provides a ‘boost’ (greater acceleration) to the ‘lighter’ (less massive elements/compounds) ‘not by the MEP process’, but by the ‘RKP’ (Received Kinetic Process) that ‘leaks’ into ‘other kinetic domains’ that remain unspoken here. If you ‘kick’ a cannon ball, it doesn’t go/travel far, but if you ‘kick’ a football it transits a much greater distance for the same ‘energy kick’ to the ‘cannon ball’! Pre-contact, the planets play a ballistic dance directed by local gravity. Post-contact, we don’t have planets, but we do have explosive debris that was ‘kicked’ with ~the same kinetic possessing angle vectors to only be speculated upon, and variant speed vectors dependant upon the mass value of the debris. Its quite ‘cogent’ that ‘lighter massive materials’ should be thrown further from the/a joint centre of gravity following a light ‘coming together’ type of collisional event IMHO. This leaves the ‘rotational element’ from the/an ‘event’. Denser and heavier material mass would remain ‘closer’ to a joint centre of gravity and provide the ‘major massive body’ for the system, whilst maintaining any ‘torque’ (rotational force) induced by the collision. ‘Lighter material’ may either ‘dissipate’ elsewhere, or ‘coalesce’ into a ‘solid body’ at some distance from the ‘major massive body’ to finally ‘orbit’ it. At least, IMHO, that’s the way that I envisage events. It’s thought the Moon has less iron content than the average planetary body, including other moons. “Supermoons” occur when the new or full moon coincides with Luna’s closest approach to Earth, although the term also gets used whenever the Moon is especially bright and close to Earth. But next Monday the term gets a proper workout as it not only offers a full moon, but will also see Luna reach its perigee, the point of its orbit closest to Earth. NASA’s using the “extra-super” moniker because the 14th is also the moon’s perigee for all of 2016. In the above something has been missed. The new model requires an earth tilt of 75 degrees. I disagree oldbrew. ‘Vectors’ are complex and ‘outcomes’ from ‘explosive decompression’ via local gravitational constraints are ‘chaotic’ without a ‘complete understanding’ of events as they unfold/occur. Here a comparison of the ‘near’ and ‘far’ sides of the Moon can be ‘visually’ made in the first two images from the left. Do you notice the difference in the ‘size of impact craters’ between the ‘near’ and ‘far’ sides? To me this strongly suggests that the ‘oldest’ Lunar terrain is ‘near-side’, whilst the ‘youngest’ Lunar terrain is ‘far-side’. I’ll explain. Following any ‘impact event’ (an ‘explosive decompression’ of mass within the local vicinity) an ‘accretion disc’ evolves around the ‘local gravity centre’ generated by the two bodies in collision, and IMHO where the original ‘two bodies’ only suffered a ‘light contact’ (glancing blow) scenario, the angle of the ‘accretion disc’ would be the ‘mean’ between the resultant angle of contact for the bodies (which we don’t know) and the ‘rotational momentum’ for each body prior to ‘contact’ (which we also don’t know). However, it is logical to presume that Earth’s orbiting Moon took ‘major hits’ in its infancy (this is evident from the ‘near-side’ graphic), but the Moon took more ‘minor hits’ to its ‘far-side’. IMHO this is conversant with Earth’s Moon ‘mopping up’ low mass debris from the accretion disc generated from a ‘Proto-Earth collision’ and the logic towards a constant ‘Moon face towards Earth’. The Moon’s ‘core’ (gravity wise) ‘is/must be’ ‘offset’ from its central point of the satellite to ‘always’ face Earth. I haven’t put the post up yet! Yes. One theory is that compression from Earth affects the near side. Tom Watters, a planetary geologist at the National Air and Space Museum and researcher with NASA’s Lunar Reconnaissance Orbiter (LRO) project, made headlines in 2010 with his discovery that the moon is shrinking incrementally. It is commonly suggested that the reason the mare only erupted on the nearside is that the nearside crust is thinner than the farside. Although variations in the crustal thickness might act to modulate the amount of magma that ultimately reaches the surface, this hypothesis does not explain why the farside South Pole-Aitken basin, whose crust is thinner than Oceanus Procellarum, was only modestly filled by volcanic products. Didn’t you notice the ‘in post’ date change? Huh? That doesn’t sound very convincing at all. Did you understand my post? I’m describing ‘bombardment’ of the Lunar surface here. Not Vulcanism, tidal stress, or thermal contraction. Anyhow, Earth ‘stretches’ the ‘near side’ towards Earth more than it does to the ‘far side’. That’s how gravity works. True, but not by the logic implied by your link. The Earth/Moon gravity interface continues to provide a ‘teleconnection’ between the Earth and its Moon. However, this ‘teleconnection’ is about ‘Earth spin’ and ‘Lunar orbital speed’. As the Moon ‘accelerates’, Earth’s ‘rotation rate’ decreases. Energy from ‘Earth rotation’ is supplying Earth’s Moon with energy to project ‘the Moon’ into a ‘higher orbit’. The “SHRINKING MOON” ‘scenario’ would be better linked with increasing altitude for understanding my input here. I’m an Engineer, not a Geologist. I don’t believe this to be so. This ‘scenario’ doesn’t take into account the ‘accretion disc’ that must follow an ‘impact event’. The ‘assumption’ that “Though both sides of the moon were bombarded by similarly large impactors” is unjustified. The ‘near side’ regions would receive ‘heavier mass’ bombardment, whereas the ‘far side’ regions would receive ‘lighter mass’ bombardment. Work this out for yourself from the accretion disc that followed the ‘coming together’ of planets. Ray: to me ‘post’ means a blog post, responses to it are comments. I have a new blog post on the way. Re: Energy from ‘Earth rotation’ is supplying Earth’s Moon with energy to project ‘the Moon’ into a ‘higher orbit’. The precession of the equator period is known to be reducing. Here you can input a year e.g. 4000 years ago the period was ~600 years longer than today. Re: Did you understand my post? Yes, the NASA idea seems to be that the effect of the Earth on the Moon was to make the near side more sensitive to impact damage e.g. bigger craters. It’s perfectly fair to theorise on the matters you raise, especially when ‘official science’ (so to speak) appears to contradict itself to some extent. I don’t have any unique theory of my own to offer in this area. Super Moon on Monday night and a spate of earthquakes around the world, coincidence? By the way , if the planetoid that hit the early Earth was formed in the same orbit, would it not be composed of the same material, which would mean that the Moon having the same composition as the Earth is to be expected? I’ll not ‘comment’ further to the rest of your ‘comment’, as it would seem that, my ‘further comment’ may ‘clash with a forthcoming’ “blog post”! I feel an obligation to respond to your comment, so I shall do so. I concur that “not all craters were created under the same energy conditions”, but the ‘energy of an impact’ is ‘proportionate to 1/2 the mass multiplied by the speed squared’ of the impactor and is dependant upon the ‘reference frame’ of the ‘observation’. I don’t accept the statement that “most impactors to the far side were mainly debris with low realative speed” because ‘massive entities in a higher orbit than Lunar’ require ‘more/greater speed’ to maintain that self same ‘higher orbit’. However, I can accept that the ‘mass’ of impacting objects to the far side of Lunar supplied less energy on impact due to their ‘low mass’ equivalence/value.